The celebrity couple Daniel Padilla and Kathryn Bernardo are in the hot sit again, hotter than the summer temperature today after the concern Netizen posted a combined selfies of them with ballots on their hands. "Excuse me, Comelec, I thought photos with one's ballot is a violation that carries with it a penalty of imprisonment of up to 6 years? And this girl was wearing her RoRo baller--isn't that also a violation? Enforce the law! File election violation cases against these two!" The love team had been very popular in social medias this past few months, aside from being one of the most sought after celebrity couple, they made a great big impact in the politics after they boldly endorse Presidential aspirant Mar Roxas. They gain lots of love, hatred and bashes in this 2016 Election. But today, this post made them really look ignorant. I doubt they both don't know that taking selfies (solo picture) inside their voting precinct holding each ballot is against the COMELEC ruling. 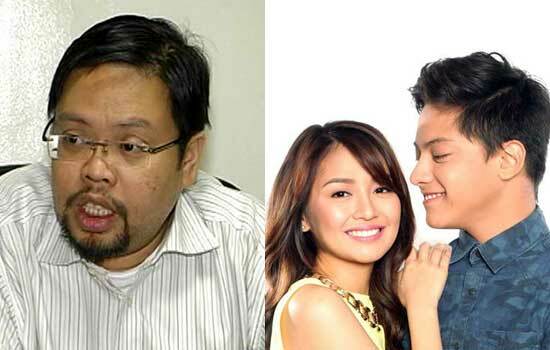 According to Philstar, the post has reached Commission on Elections (Comelec) spokesperson James Jimenez, and on the latter's Twitter account he said, 'kathryn and daniel and i need to talk #PiliPinas." What do you think will COMELEC do on the said issue? Share your thoughts below. Comments or suggestions about "'KathNiel' do their Celebrity Selfie with their 'Ballots'" is important to us, you may share it by using the comment box below.